Feeling super vintage-y and whatnots, you guyssssss. :3 Ohhh yeaaah. <3 I was also freezing my balls off, but that's neither here nor there. Heh. So, apparently, I'm just really into the whole "black is my happy color" thing, because I just can't escape it. >_< I added something bright to compensate, though! I love the burnt orange mixed with black. Stripes are cool, too. They're always cool and the fact that they adorn a pretty rad vintage dress is even better. :DDD I added the polka dot tights for some additional contrast in patterns and maintained the masculine vibe with the vintage tassel loafers. 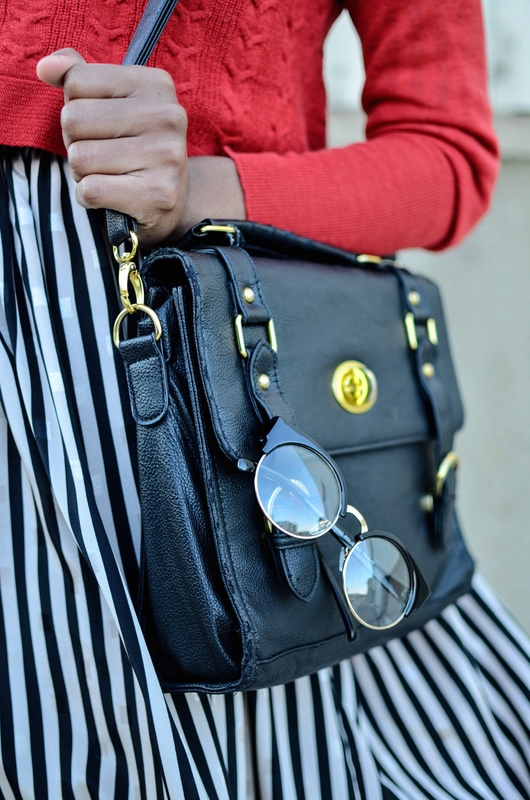 The icing on the vintage cake has to be these super cute horn rimmed cat eyes from my sponsor, Sunglass.LA. I love them SO much! <3 They're $10 and the frames come in four different colors. This happened to be the perfect outfit for a fancy brunch and good conversation with my partner. *^_^* Unlike last time, we most certainly drove and blasted the heater, because OMFG! T_T It was so cold! 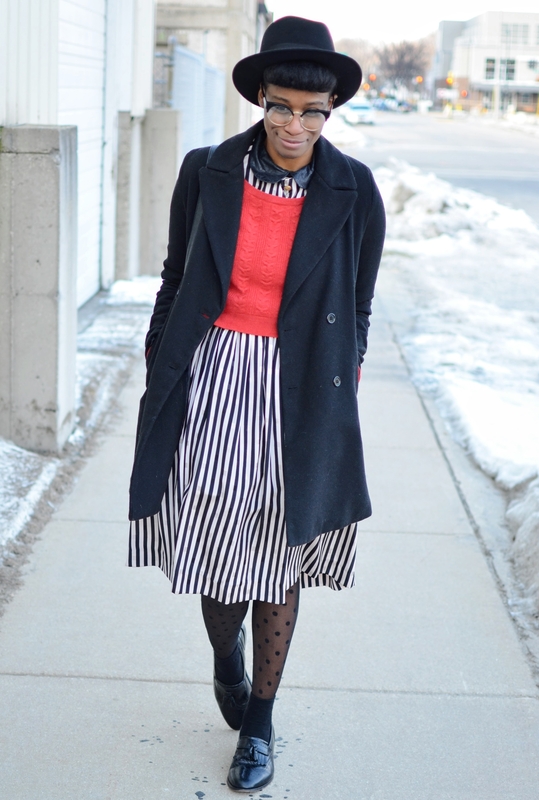 Sorry about the cold, but I love the striped dress with the red sweater! With freezing temperatures, so good you added the dress underneath, not only to profit from the nice collar, but yes, more fabric was welcome! Really a beautiful outfit, I loved the glasses - and the price! - and the polka dot tights! I though the sweater was red, but u are right, burnt orange it is. Hope you have a very nice weekend! Love the polka dot tights! I feel that 2 dresses is totally justified considering the FREEZING temps! ;) I mean, what is a slip but an under dress for extra warmth, really? that hairstyle looks soooo perfect and amazing with that hat :D <3 loving it! !